What? 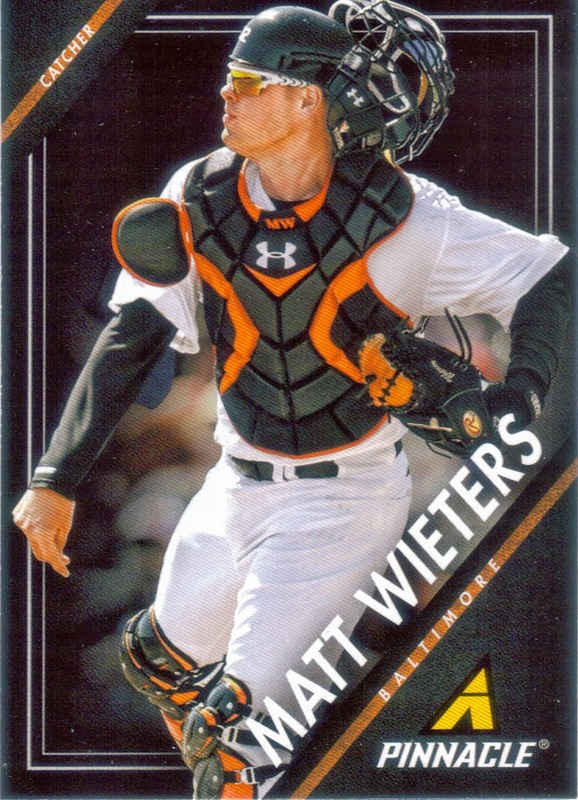 A Matt Wieters Card? Yeah! I went to the LCS a couple weeks ago and after buying a few packs, I pulled a surprising addition to a PC that has been quite sad lately. Yes, Matt Wieters. For some inexplicable reason, Wieters does not appear in Topps sets. He originally had a deal with Razor (are they even around anymore?) 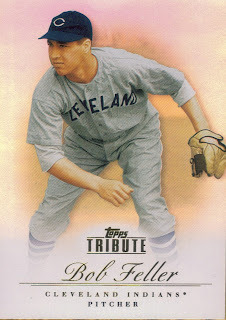 and I think he was in some Tristar products too, but never Topps. Well, I picked up a pack of 2013 Panini Pinnacle and there he was. I was actually really happy, and the Pinnacle product is really nice. My son, Chris, pulled a nice acetate/clear Prince Fielder that looks pretty awesome, so it is a good product. I still love Topps, but I don't know why a little competition wouldn't be healthy for the hobby. Well, the 2013 regular season ended today with an Oriole win over the Red Sox. The O's will be going home as the Red Sox will advance to face the winner of the wild card. The wild card winner will be any one of the three teams of the Rangers, Rays or the Indians. Of course, as I am writing this, the Rangers have not yet assured themselves of a play-in game to the play-in game. They are leading the Angels by two after seeing the Rays and Indians win earlier today. So, on the final day of the season, I wanted to show another addition to my Reimold PC in the above 2013 Topps Target Red parallel. I like the red border because it really pops. If you are familiar with this blog, you will know that I do enjoy a red card due to its being able to jump off a page (see my posts on 1954, 1958 or 1959 Topps). I hate that the Orioles didn't make the playoffs, but I am kind of glad the season is over. It will be good for the guys to reflect on the season and refresh themselves in preparation for next year. I think the Orioles will be a force next year, so let's get the guys recharged and go for it all. 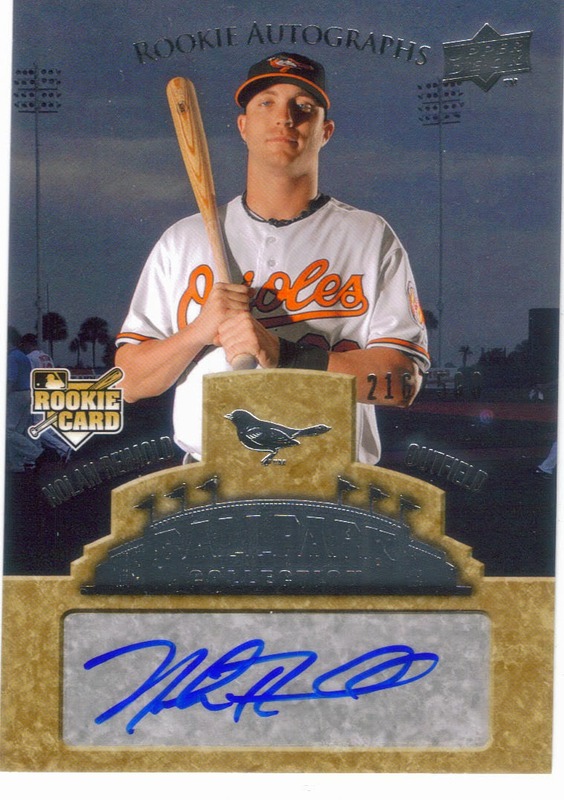 I picked up another addition to my Nolan Reimold PC when this 2009 Upper Deck Ballpark Collection RC auto came in the mail yesterday. 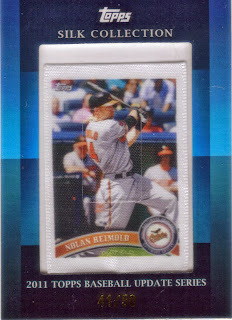 I can't believe I didn't have this yet, but for $4.99 and free shipping, it is now a part of my Reimold PC. I'm not a fan of Upper Deck, but I do have to say that Ballpark Collection was pretty nice. It has a good shot of Nolan against a nice backdrop with a sticker auto. I was also able to add, for another $1.99, a third 2009 Bowman Sterling auto of Nolan. I've already pictured that card on here twice, so I will just mention that I got a third in this post. I have added, or am in the process of adding, quite a few Nolans to my PC. I have a lot of parallels pending, and once they arrive, I will be updating my wishlist to include a bunch of the 2013 Topps parallels that I need. 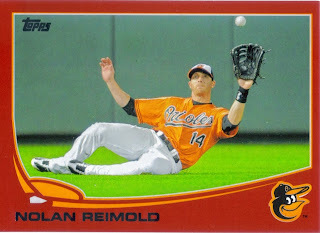 So, if any of you have any Chris Davis or Nolan Reimold 2013 Topps parallels, please shoot me an email to see if I need them. I would really appreciate it! Recently, Sports Illustrated featured Orioles slugger, Chris Davis, on a 'regional' cover. Regional? Odd. Anyway, yeah, he was featured on a regional cover of SI, so I figured, I'm in eastern NC, I should have a good shot at being able to pick up this cover at a local news stand or bookstore. Nope. I went into several establishments that sold magazines, a few of them didn't even carry SI and the ones that did had some lame soccer player I've never heard of on the cover. I had my spine, but no Orange Crush. Luckily, there is this invention called Ebay, which I'm sure you all may have heard of. Well, I went on Ebay and found someone selling multiples of the Davis SI (which I later found out had sold out in the Baltimore 'region' after being on stands only a couple hours) for $10 each, so I took the plunge and bought 3. I got one for Ryan over at O No Another Orioles Blog, and my good buddy Michael who has no blog. I haven't actually had the time to sit down and read the article on Davis, but I will soon. I really like the fact that Orioles are starting to be recognized again. The future is really looking bright for them, that's for sure. I was looking for birthday presents for a couple fellow bloggers the other day and during my searches for awesome cards for their PCs, I decided to look up a few for my own PCs as well. I was able to find several Nolan Reimold cards that I still needed (and one that I already had 2 of, but saw a great deal) at really cheap prices, so I jumped on them. One of them is the above 2011 Topps Silk Collection from 2011 Topps Update. Even though Nolan has been hurt this year (and last year), he is still one of my favorite players. It helps that he was awesome to me when I met him in 2010 (his wife is also equally as awesome). He's a really good dude and I sincerely hope he is able to come back to the Orioles next season and show the potential that he has had flashes of in the last few seasons. I plan on showing the other Nolan cards that I picked up soon, so, continue to keep an eye on the blog to see what I got! Well, as you all may know, I tend to wear my emotions on my sleeve as far as the Orioles (and other things in life) are concerned. I vented on this blog on August 27 after they were smacked around at that time. I think it was the 3 game sweep by the Diamondbacks, but I don't remember now. This season has been a great one, regardless of how they have tanked it in September. Manny Machado emerged as a star (before he hurt his knee on Monday, but thankfully, he will be back). Chris Davis has shattered the Orioles' single season home run record. Chris Tillman solidified himself as a top starter and has the most wins for the Orioles (16) since Mike Mussina won 18 in 1999. A lot of things have gone wrong for the Orioles since the All Star Break, most notably, the bats have gone into a deep freeze and the bullpen hasn't been what they were last year. The Orioles have proven that last year was no fluke. They may have had quite a few things go their way last year that haven't panned out this year, but they are relevant. No longer are they the doormat of the AL East. They appear to be here for the long haul, seeing as their core players are all very young and are locked up for the next few years. So, yeah, I'm upset that they didn't make the playoffs, but they do look poised to contend for the foreseeable future and two years ago, that seemed eons away. I got a really nice package in the mail today from my good friend, Scott from the blog: Mr. Baseball - Scott. Scott's a really great guy, whose birthday is coming up as well. He sent me a stack of Orioles cards that I will hope to post at another time (probably after this travesty of a season is finally put out of its misery), but I really wanted to focus on the jewel of the package, this 2012 Topps Museum Collection Adam Jones jumbo relic. The card looks awesome and I am actually a fan of the huge swatch. I think the card is great, and I really appreciate Scott hooking me up for my birthday. Please head over to Scott's blog and give him some follows and comments, he needs and deserves it! I completed a trade with my good buddy and fellow Orioles fan, Michael, when I received this signed Andy Pafko baseball from him a little less than a month ago. Michael included the ball in a box of stuff he sent me for my birthday (which will be posted sometime soon). The ball isn't an OMLB ball and you can tell because of the slight bleeding of the signature, but it still looks really good. Pafko (b. 1921) played in the majors from 1943 to 1959 for the Cubs, Dodgers and Braves. He had 1,796 hits, 213 home runs and a .285 career batting average. He won the World Series with the Milwaukee Braves in 1957. I completed another trade with a friend of mine, Zach, when I sent him my 2013 Topps Chris Sale auto in exchange for the above Nick Markakis/Alex Rios dual auto from 2008 Topps Co-signers. The card isn't numbered, but it looks really good. I kind of wish there was a better player on it other than Rios, but beggars can't be choosers. Zach also threw in the above pennant from the inaugural football game for UNC-Charlotte, my Alma Mater. Zach also goes to school there and was at their first football game of the season. I wish Charlotte had a team when I went to school there. I probably would have had some fun tailgating. I hope to catch one of their games sometime soon, but with them being 4 hours away, vs the minutes away I am from ECU, I will probably see more Pirate football games. Thanks for the trade, Zach! I'm sure you all have noticed that I have been absent from this blog over the last few days. The reason was because I went out of town for my birthday, which was Saturday. 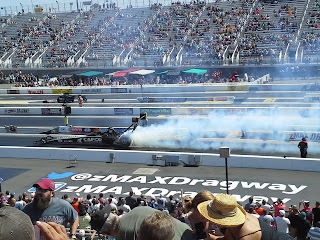 My wife, son and I went to ZMax Dragway in Charlotte for the NHRA Carolina Nationals. I had been to ZMax one time before, back in April 2012 for the 4-WIde Nationals. 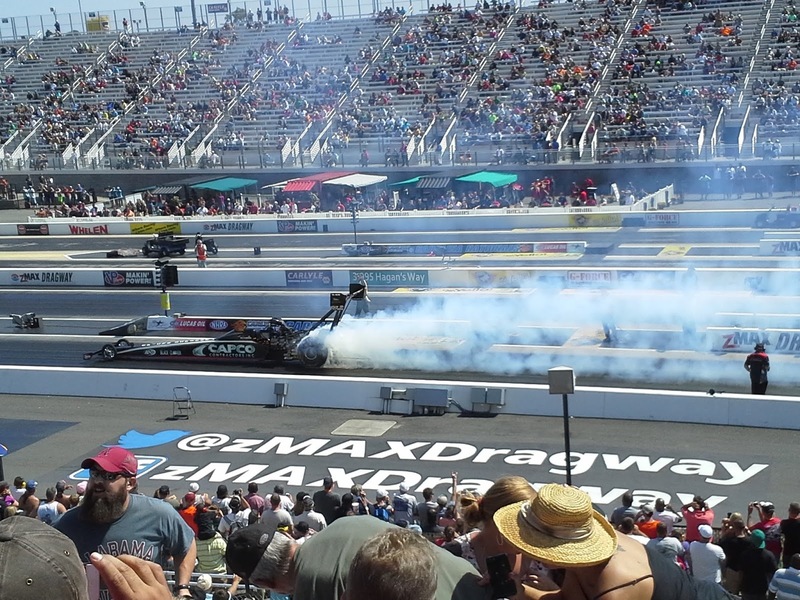 This time around, it was only 2-wide and the race was part of the NHRA's 'playoffs' or 'Countdown to the Championship. This added a bit of drama to the event. I'm not the biggest fan of this setup, as I was brought up in the era of "He who wins the most races is the Champion", but it makes it so that no one racer is dominating the class, so I guess that's ok.
We spotted Shirley in front of the Don Schumacher hospitality area recruiting fans to attend the benefit breakfast for B. R. A. K. E. S. (Be Responsible and Keep Everyone Safe) teen driving initiative, which was founded by fellow Top Fuel racer, Doug Herbert. This is a good program which teaches teen drivers proper safe driving techniques and was founded by Herbert when he lost his two sons in a road accident a few years back. I've known Doug Herbert for several years and I was happy to contribute to his program while I was there. We talked to Shirley for a bit outside of the breakfast area and she was kind enough to pose for a picture with the 3 of us. She was really, super nice, I couldn't have asked for a better time meeting her. She has always been good to me. As you can see, the photo turned out awesome. I'm going to print it out and hang it up with my Brooks Robinson and Nolan Reimold pictures. Meeting her on my birthday meant the world to me, so you know I was happy. On Sunday, Chris met current Top Fuel dragster driver, Leah Pruett and got her autograph. I think he was a big smitten by her as he wanted to go back and congratulate her after her round one win over Tony Schumacher. She was really nice as well. She took the time to thank Chris for coming back by her pits and congratulating her. She said she won the round because he had brought her good luck. We had a great time, but I am now feeling it. I didn't get much sleep over the weekend and am now feeling like a zombie. So, that being said, I will retire for the evening and will return to my regular blogging probably tomorrow. I'm a big fan of the 'Ice' parallels that have been in Bowman over the last few years. 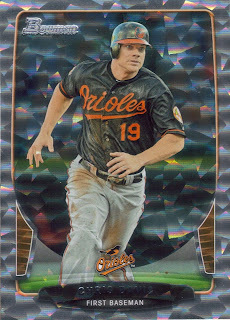 I'm an even bigger fan of Chris Davis. He really has come on this year. I'm so glad, because the Orioles were desperate for a power hitting first baseman for a long time (since Palmeiro was run out of town). 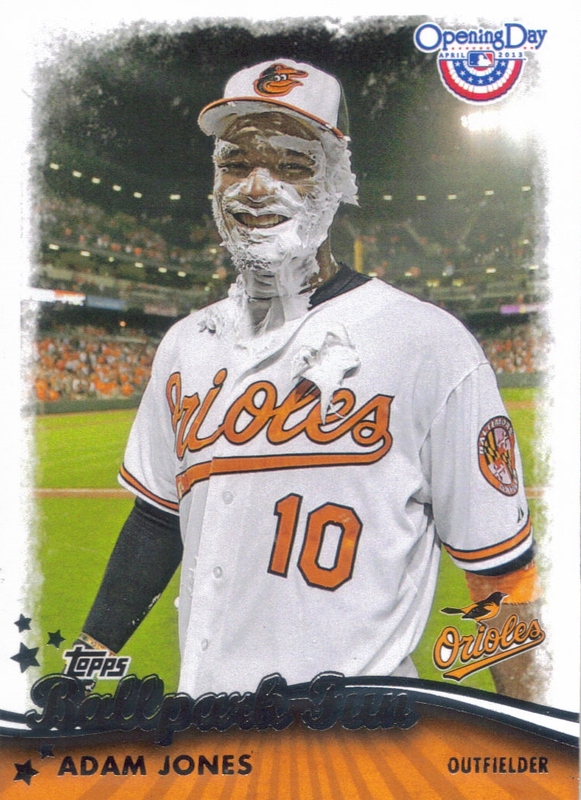 Davis is my newest PC, but I've been gathering his cards since the O's picked him up at the end of 2011. I would love to get the red ice parallel. Those are numbered to 25, I think, so they are tough to find. I got this for a couple bucks off of COMC and I'm happy with it. I want to grab a few more O's, so I will be checking the sites and see what I can find. During my visit to COMC.com the other day (when I was finishing up my 1971 set), I decided to add a couple PC needs to my cart. 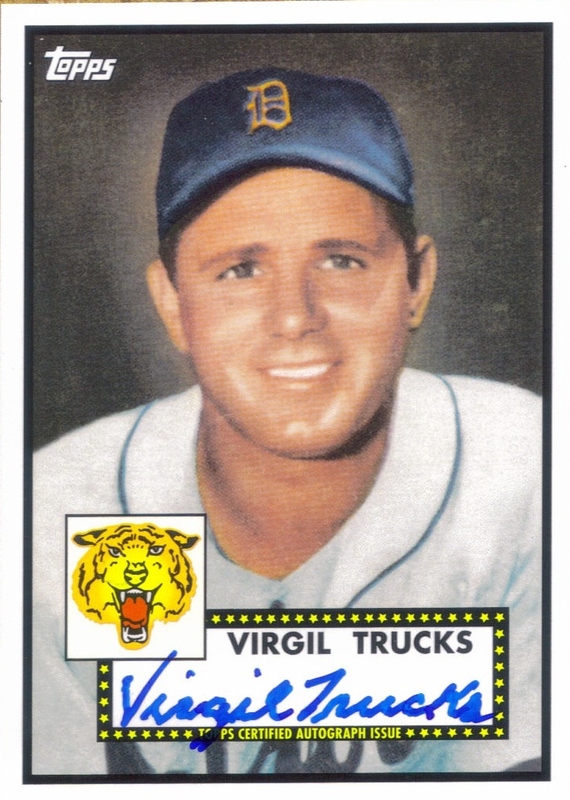 One of which was a card that I have been wanting since 2011, the Topps Lineage Virgil Trucks '52 autograph. This card was one of two final autographed cards that I have been looking for to go into my Virgil Trucks Collection. I needed this one and the 2011 Topps Black Diamond Autograph. I have seen one of those on Sportlots for $100.00, but I feel like that's really high, even for an auto of Mr. Trucks. I'll own it someday, though. I know there are some miscellaneous Trucks cards out there that I need and I will pursue them when I can, but this one will likely be the final piece in the collection for a while. We'll see though, because I may be able to find some of the odd-ball 1950s stuff cheaply. I'm just glad to finally have this one. It started Sunday, May 29, 2010 and ended today when I got the final two packages from Sportlots and COMC, respectively; I completed the 1971 Topps set. I think it is awesome that my 'completer card' is the above Harmon Killebrew. I could have sworn that I had already picked it up, but apparently I must have balked at a price or something, because I still needed it in the end. I'm glad I didn't keep track of what I spent total on this set because it probably would make me cry, but I do know that I started it with an initial investment of $60 when I picked up the partial set at the Winston-Salem card show. 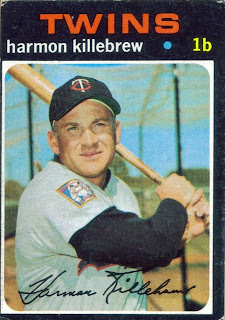 Now that I have put 1971 Topps to bed once and for all, I can now concentrate on 1959 and 1969 when I go to card shops and shows. That will hopefully trim down the time needed to scan through boxes at shows. We'll see though. 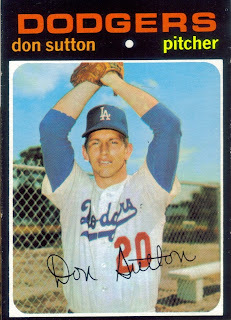 I am now 12 cards away from finishing my 1971 set after receiving 7 more cards that I needed. 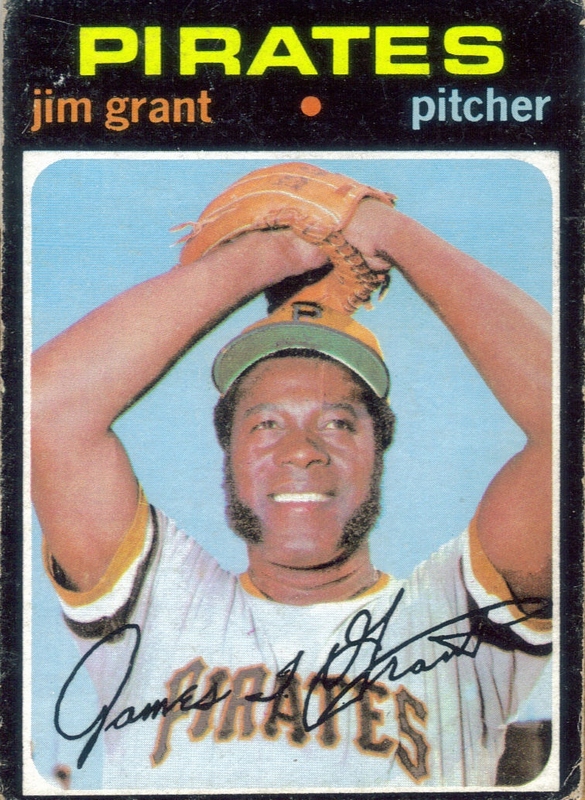 One of which is another appearance on the blog of Jim "Mudcat" Grant. Check out those sideburns. I kind of wish the condition of this card, and the other 6 that I got were in a little better shape, but that is a common theme with both the 1971 set and trying to build a set consisting of High Numbers on a budget. I did get a nice unmarked version of the final checklist for the set, so that's a plus. I always feel weird paying good money for a checklist, but I guess when the set is 42 years old, a checklist can become a tough card to get. Oh well. I just completed a trade with Dion from the blog "Dion's Autograph Collection" where I sent him several signed cards in exchange for the above Luke Appling signed baseball. Appling (b. 1907 - d. 1991) was born in High Point, NC, not too far from where I grew up. He played in the majors from 1930 to 1943; 1945 to 1950, all for the White Sox. He had 2,749 career hits, 45 home runs and a career .310 batting average. 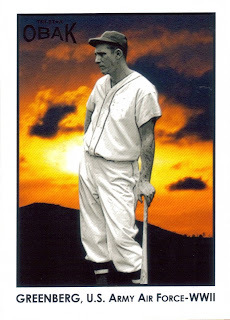 He was a 7-time All Star and finished as high as 2nd in the MVP voting (twice - 1936 and 1943), losing to Lou Gehrig (36) and Spud Chandler (43). He was the AL Batting Champion in 1936 (.388) and 1943 (.328). He was also very tough to strike out. The most he ever struck out in a season was 41 times. He had one other season where he struck out 40 times. Appling was elected to the Hall of Fame in 1964 when he received 70% of the initial vote and 94% in the runoff vote. He is my 92nd Hall of Famer. The ball is a Bart Giamatti ONL ball, which is kind of odd, since Appling spent his entire career in the AL. Dion got the ball at Braves Spring Training a long time ago, so that explaing the ONL ball. I really like it, though, as I believe it is my first Giamatti ball. I just got a package in this afternoon from a recent Sportlots purchase. 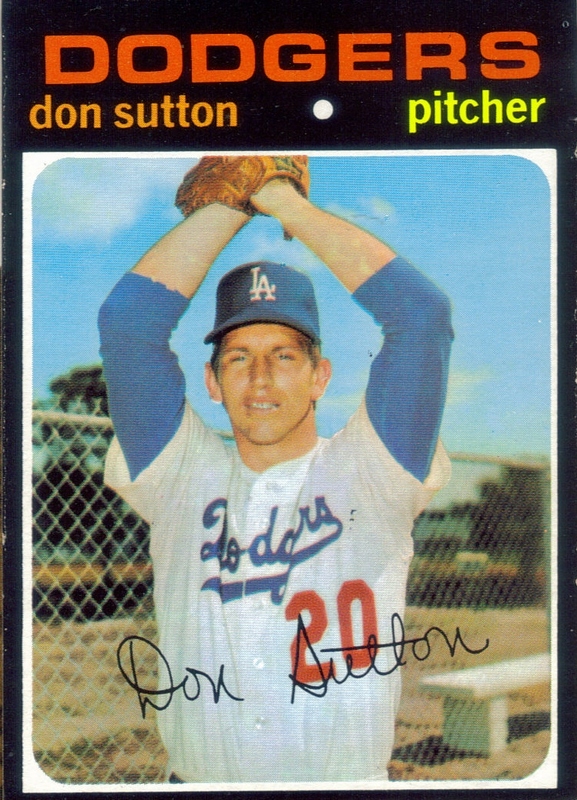 This package had 6 cards that I needed for my set, the most notable was the above Don Sutton. Also among the cards were several high numbers that I needed. It is so tough building these pre-1974 sets because of those high numbers. They seriously carry a premium. After this package, I need only 19 cards to finish this set. I can definitely see the light at the end of the tunnel on it. I found a few more cards that I had yet to post. I got these two cards from the Charlotte card show when I went a couple weeks ago. I picked up the above 2012 Topps Tribute Bob Feller for around $1, along with the below 2013 Topps Museum Collection Brooks Robinson (also for around $1). I doubt I will buy any packs of either product since their price point is well out of my range. I'm perfectly content in picking up my PC needs as I see them. I do have to say that Museum Collection is quite nice. 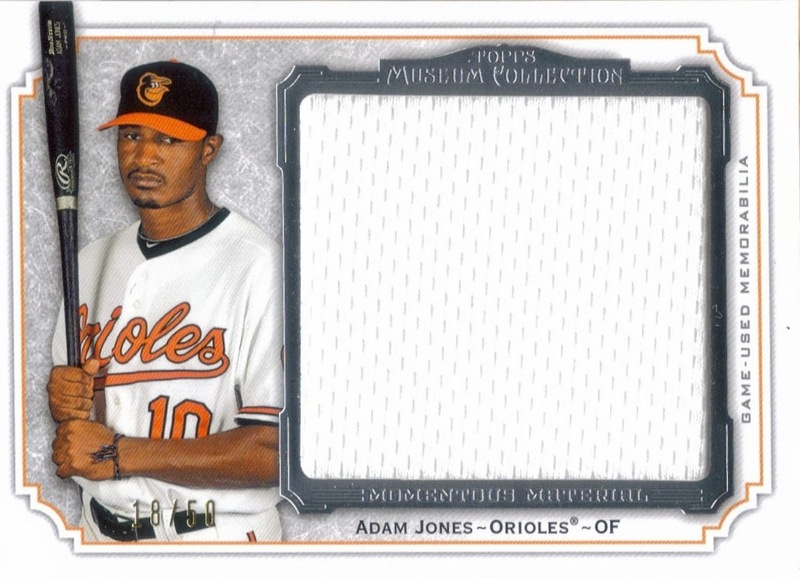 I definitely plan on getting some more Orioles from this set as time goes on. The Tribute is nice as well, but that design hasn't really changed a whole lot over the years. I kind of feel like, once you've seen one, you've seen them all. With the posting of this card, I have finally caught up on all of the mail and trades that I received prior to and following my vacation. I was filling my cart on COMC a while back and decided that I wanted to add a Hank Greenberg card to my fledgling Greenberg PC. Since I am a big fan of the old-time Tigers, I have developed a liking for Hall of Famer Hank Greenberg. He was a monster in the brief career that he had and is oftentimes overlooked when discussing the all-time great sluggers in history. The Obak set is a really nice set, as can be seen from the scanned card. I really like the sunset in the background. In all, a very sharp looking card. I still want to bust a box of these at some point. Maybe sometime soon. I've got a few more trades pending, so I'm hoping I don't go through a dry spell on here while waiting on stuff to come in. I can tell you that I went through Sportlots and COMC yesterday and am awaiting the arrival of some cards that will close the door on one set that I'm working on, so stay tuned! 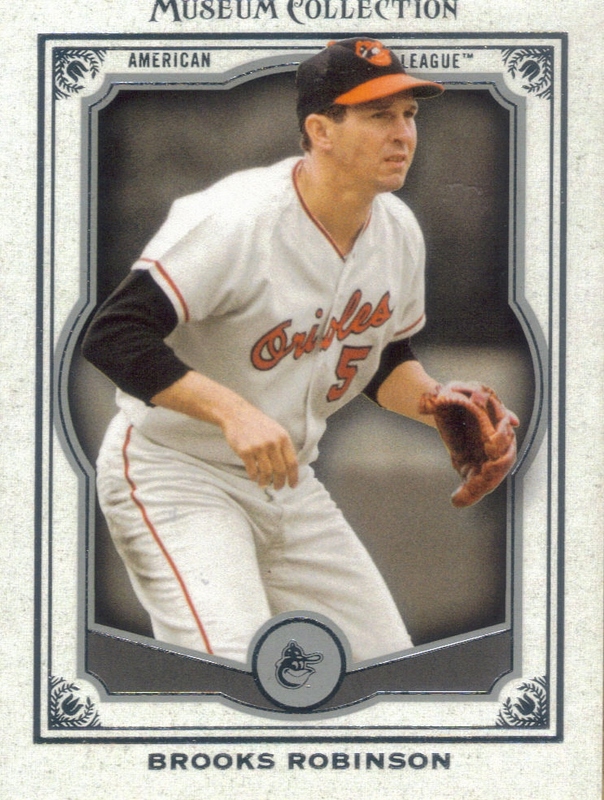 Since the Orioles played a day game today and it is storming outside now, I had some time to do some updating to the blog. I added my needs from 2013 Topps Series 2 Emerald Parallel and I also added a list of autos that I had available for trade. So, head over to my wishlist and trade pages and see what all I have available and what I am looking for. 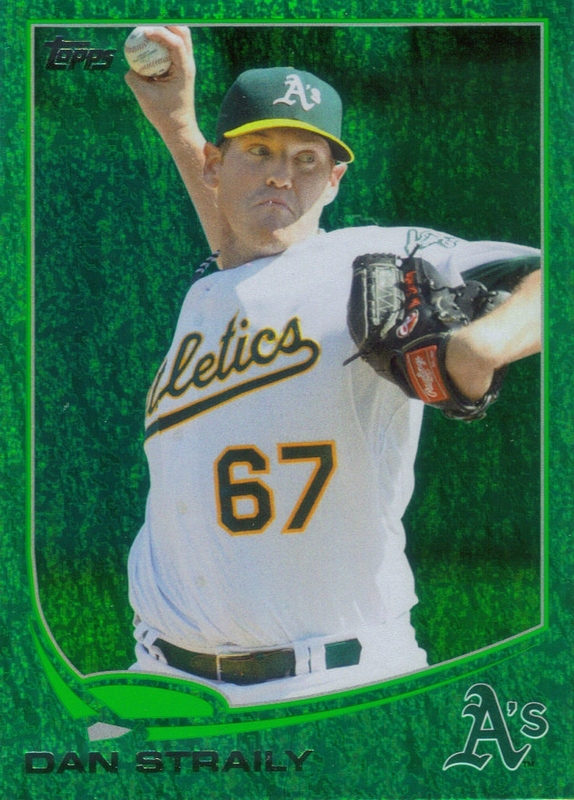 I wanted to post the above Dan Straily emerald parallel since I received it in a trade a few weeks ago from Nachos Grande in exchange for a Team USA Barry Larkin. I'm glad folks are still trying to help me make this set a reality. We'll see how it goes. Anyway, my trade post from the other day was so successful, I decided to try to see what I could get out of the other autos I had in my 'sale' box. So, please take a look and let me know if any of those are to your liking. ESPECIALLY, if you have a Hall of Fame signed baseball you would like to trade. That would be REALLY nice!